Ministry of Defence, Indian Army has relesed notification for the Army Recruitment Rally (For Bhai-Bandh, Relation Bharti). Army Recruitment Rally will be held for Bengal Engineer Group, Corps of Engineers, Indian Army under Unit Headquarter Quota for sons of Servicemen/Ex-Servicemen/War widows and real brothers of servicemen/Ex-servicemen & sportsmen of International/National level. This rally is scheduled from 15 to 19 May 2017. Soldier Technical 17 to 23 yrs Candidate should be 12th Pass in Science stream with Physics, Chemistry, Maths and English with minimum 50% marks in aggregate & 40% in each subject. Soldier General Duty 17 to 21 yrs Candidate should be 10th Pass or equivalent pass with minimum 45% marks in aggregate & minimum 33% in each subject OR 10+2 pass (any stream). Sol Clerk/SKT/IM 17 to 23 yrs Candidate should be 12th Pass with 60% marks in aggregate and 50% in each subject. English and Maths/Accts/Book Keeping are compulsory at 12 th or 10 th level with 50% marks. Selection of the candidates will be done on the basis of written and physical test. Desirious candidates may appear in the army recruitment rally on 15 to 19 May 2017. The gate open timings will be 04:30AM to 05:30AM (no candidate will be allowed entry after 05:30AM) as per following schedule at Centenary Pavilion Ground, Bengal Engineer Group & Centre, Roorkee. Candidates may download the application form through the official website www.joinindianarmy.nic.in. (Help Line No- 01332-275652 (Timing- 09:00am – 11:30am, 06:30pm-07:30pm)). (d) NCC Certificate if any. (e) Sports achievement certificate if any. (g) Caste Certificate (in case of SC/ST candidate). (j) An affidavit as per format (can be downloaded from website www.joinindianarmy.nic.in). (l) Bond of Indemnity (can be downloaded from website www.joinindianarmy.nic.in). 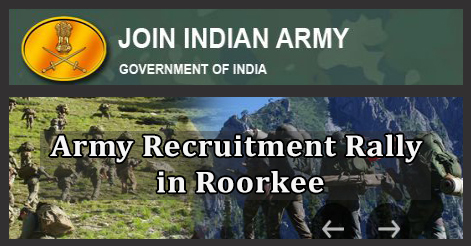 Help us to improve this article/job posting "Army Recruitment Rally in Roorkee – BEG Bharti Roorkee". We would be glad if you can comment below and provide your valuable suggestions and feedback. If this page have any wrong information/list or out of context content, then you can report us as well. I have completed my diploma in civil engg. with 70% but 12 with 54% and in maths I have scored 33 marks. Can I try for technical post in beg? please tell me about 15 may 2017 relation ship selected candidate list. Girls can apply for this job ?